The accumulating conversation on mobile devices is not something to ignore. All around us are examples of the unceasing usage of tablets and smartphones. People love their personal mobile devices, and there is no reason not to. Tablets in particular, are growing in popularity more than ever. From personal entertainment to composing small business proposals, it seems you can find use of tablets for almost anything. With this massive growth of tablet usage around the world, why not put these nifty little gadgets in the hands of students. Schools should look into the benefits of BYOD (Bring Your Own Device) for not only students, but for the teachers and school faculty as well. 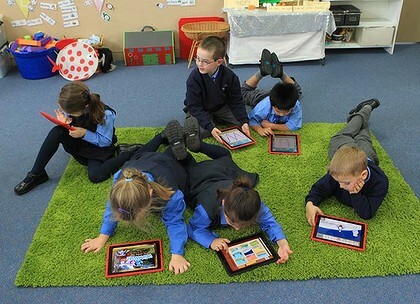 The use of tablets in classrooms can be beneficial in many ways. Portability and versatility of tablets make them a considerable asset in the classroom. The application of eBooks available for tablets is more efficient and cost effective than purchasing and replacing textbooks. The interactivity involved with the use of tablets in the classroom shows a positive experience for students. Here is another interesting way to look into the reasoning of this IPad phenomenon. The world has become more flat, or globally interconnected, allowing businesses all over the world to compete on a more equal playing field. Some of the many reasons this has happened is the use of computers, the Internet, and wireless. As the world becomes more “flat”, we should prepare our children with the tools being used. Tablet usage is increasing in the business world, so why not increase the handling of tablets in schools. Lets educate and familiarize young students with these tools, advancing their knowledge on the instruments used in this “flattened” world. According to Apple CEO Tim Cook, 92% of the fortune 500 companies are using tablets as part of their IT infrastructure. According to ABI Research analyst Jeff Orr, Consumers and enterprises are expected to make 2013 a record year for tablet shipments, at some 145 million tablets. As you can see, tablets are currently being used in many important organizations and expected to increase in the near future. The benefits derived from tablet usage are helping businesses all around the world. BYOD implementation in schools is a great start to not only enhance the learning experience in schools, but better prepare students for what their future holds... literally. If you are considering bringing these devices to your school wireless network we are here to help. If you have any questions or would like a free consultation just contact us here. Next Post: What should be included in a Wireless Network Design?